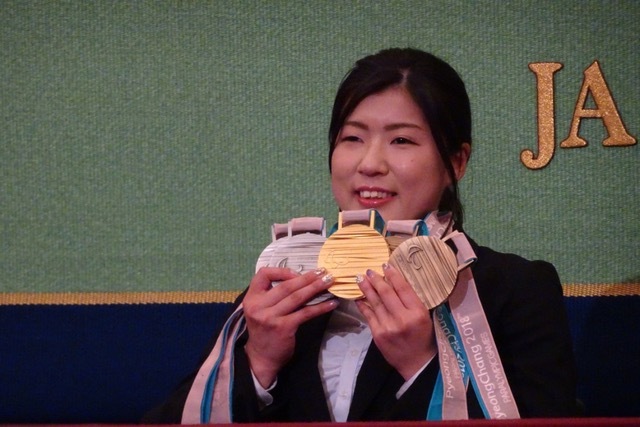 Momoka Muraoka, who won five medals at the recent Pyeongchang Winter Paralympics, was all smiles during her post-Paralympic news conference at the Japan National Press Club on Wednesday. The 21-year-old Alpine sit-skier, who was Japan’s flag bearer for the opening ceremony, won gold in the women’s giant slalom, silver in downhill and slalom and bronze in the super-G and super combined. She won both Japan’s first medal and first gold medal in Pyeongchang. 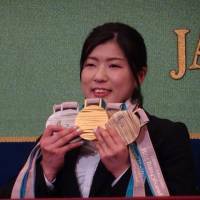 She also set the record for most medals won by a Japanese athlete at a single Winter Paralympics. “Every time I received a medal, I had to convince myself that this was real life. Even I didn’t expect to do this well. To be honest, a part of me felt like I wouldn’t be able to get gold, so I surprised myself too,” Muraoka said at the news conference as she looked down at the shiny gold medal hanging around her neck. Despite overcoming the odds, the athlete from Fukuya, Saitama Prefecture, is nothing but humble. Muraoka has been bound to a wheelchair since age 4, when she was diagnosed with transverse myelitis, which causes inflammation of the spinal cord. She took up skiing at age 9 and began to pursue Paralympic Alpine skiing five years later. “I’m so happy and blessed to be able to bring back all these medals and make my country proud,” she said. But things have not always been easy. Four years ago at the Sochi Winter Paralympics, Muraoka was left disappointed. She fell in one of her three events and failed to finish higher than fifth in the others. She explained during the news conference how she used the disappointment she felt to her advantage and pushed herself to do better. She made her mark on the international scene at her first IPC Alpine Skiing World Championships, which is staged biannually by the International Paralympic Committee. She won silver in the downhill and bronze in the giant slalom at the world championships, competing alongside Paralympic and world championship medalists such as Austria’s Claudia Loesch and Germany’s Anna Schaffelhuber. “No matter how many times I’ve done it, skiing down that slope will always be scary. Honestly, there are often times when I feel like I can’t do it at the last minute,” she explained. However, by making use of her coach Kazushi Shido’s knowledge on the best way to make use of the mechanics behind her chair ski and everyone’s constant support, Muraoka was able to attend the Pyeongchang Games stronger than ever. “I tell myself that as long as I do what I always do, I’ll be fine,” she said. Between her lack of sleep with 4 a.m. wake-up calls and her constant self-doubt, it was her parents’ support that got her through the recent games. “My parents were there for me every step of the way. There are no words to express how thankful I am for them. I couldn’t have gotten this far without them,” said Muraoka, who is also a third-year sports science student at Waseda University. Although she will not be competing at the 2020 Tokyo Games, the athlete expressed her excitement for the upcoming Paralympics. She also stressed that the limited attention the Paralympics receive compared to the Olympics is disheartening and hopes this will change. “It isn’t over with the Olympics, the Paras should be just as anticipated,” she said. She also added that she hopes Japanese society wakes up and improves wheelchair access around the city ahead of the games. Once a shy girl who stayed indoors, ashamed she couldn’t play like the other kids, Momoka Muraoka is now proving to everyone that anything is possible.